New page! I don’t think anyone who commented predicted where I was going, which is surprisingly gratifying. I was so super not feeling the colors on this page. Too many characters in a small space! Haha… I procrastinated every few minutes, so sorry if it looks weird or bad or something XC Oops, I see some bad proportions too… Why do I always see the mistakes after I hit upload? Just want to reiterate thanks to readers new and old for following so far. I realize that its been over 6 months that I’ve been updating. Kind of crazy, I really expected to be done with at least a chapter by now, haha. Mr. Slow and Steady, thats me. Ah well. One quick plug for a comic done by a reader (I don’t plug everyone who asks me but I make exceptions now and then): Cealdian. If you like the art in my comic, you’ll probaly enjoy looking at Cealdian too! Less than a dozen pages in but the story looks to be interesting. I love epic labor of love type comics… this could be a good place to jump on the bandwagon for a new one. First! And I love this page, I think one thing that really makes this comic stand out is your talent for drawing expression perfectly. Thanks very much! The expressions are my favorite part! Hey, have you changed the website’s tags/keywords lately? ‘Cause when I type “Meek Comic” or something similar into Google, this site used to show up at the top. Now I can’t find it at all through Google–I have to link to it through other mentions. It’s kinda weird. D: Really? I don’t think anything has changed! I think you’re right though, I don’t see it there either. I’ll ask my friend who works on my site to see if this can be fixed! I hope so! Like I said, the comic site was always my first result, but now it’s just vanished! D: Good luck fixing it! 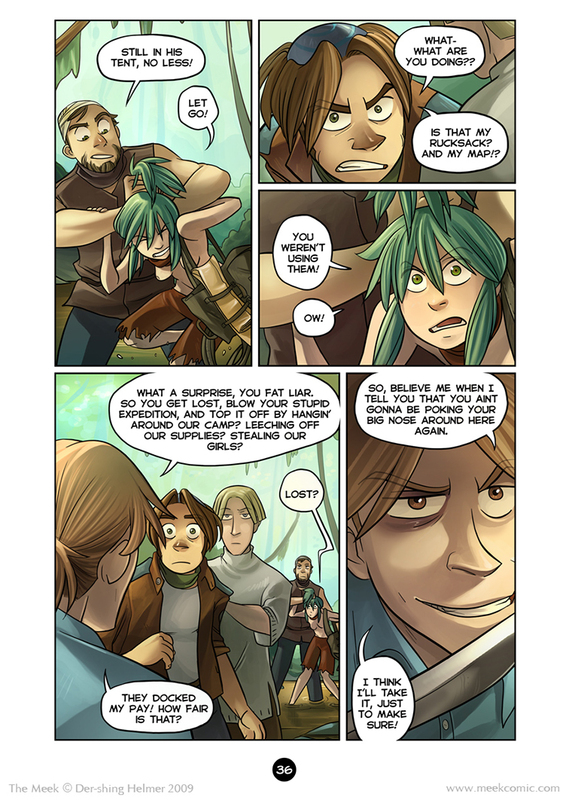 Love Kiz’ face in t he last panel – and no, had no idea you were gonna go this way! “Lost?” Oho, now we’re getting somewhere. Good way to keep us guessing. I defintely didn’t see this coming. I like the expressions here! She has pants? I missed this. She does now! Obviously she’s been sneaking around. Hey! Watch it, bub!! I love big noses, so I LOVE Pinter’s nose. His expression in the second panel is so cute… ADVENTURE!! Let me just say that while Pinter isn’t the typical male protagonist (and I’m assuming by his screen time that he IS a protagonist) that most people would generally go for (ie. fangirl over), the personality you’ve given him is such that after a page or two, one is prone to forgetting that he’s not tall and lean with super-model looks (actually, none of your characters so far are, a fact that raises my respect for your skills to new heights). Uh…basically, this all boils down to “Pinter rocks”. Ahaha, thanks for commenting XD I’m happy to hear that you like his character! I guess its like in real life, where if you like someone’s personality you mostly forget about their physical attributes. She grabbed the pants from Pinter’s tent when she grabbed the rucksack, map, and rope, plus whatever else. Nice touch. One goof I saw was with Pinter’s skullcap. It’s too far forward, so it’s on the top of his head, instead of the back. Other than that, it looks good. Yeah, his cap is all over the damn place XC I should probably make a ref sheet or something… then again, work is hard. I love this comic more and more. Yay, new page! I’ve been checking in constantly all day for this page O___O. Clearly I…need a life. Oh man, I’m loving Kiz’s crazy expression in that last panel. Haha, I was pacing around and fretting for days, thinking maybe you didn’t get it, should I try sending it again, etc. It’s alright though, it was QUITE the surprise, you totally made my night. I absolutely love the colors. The colors for the past couple of pages have been outstanding, they make my heart melt and give me the outdoorsy feel. I adore this! Keep up the great work, can’t wait for the next page! lolll that emoticon parade is strangely apt. So glad you’re liking everything okay! Can’t wait too see what happens next! Pinter is my favourite, I don’t think I’ve said that enough in the last pages. This Kiz chap is getting scarier by the panel! I blame his slightly deranged expression, and also the way he is waving his knife around as he is going to put someone’s (possibly his own) eye out if he keeps doing that, really. Angora… you do know that a scarf’s not as important as a shirt, right? Right? XD Looks like we’re headed for some nice action. I love Pinter’s expression in the second panel. He’s not all “She’s being hurt! I must protect her!” but just angry about her taking his stuff. A very human reaction. …Kiz is still a douche. I think Angora’s hair is a different shade of green every time we see her. Haha, its one of the benefits of having plant hair, I guess. Maybe she’s been eating iron or something. I would say she likes not wearing clothes (especially after reading the wiki) and is just now starting to understand that clothes are a big deal to people. I agree, Betsy! Also, it seems like she tried to imitate Pinters dressing, since the first time she saw him he was just wearing his pants. I think I have a massive crush on Pinter. Yes, yes I do. This is my first time commenting your comic. Of all the web comics I’ve read this makes my top five list so far; Along with Inverloch. I love your use of expression and body language, I’m trying to work with body languagein my art now in fact. The colors in this comic are amazing, as to be expected. I must say, this is quite an epic turn of events, I really didn’t see it coming. Kinda an unfortunate misunderstanding. I’m guessing there gonna escape now and have an epic adventure. Aw, thanks very much! I’m honored that you’re enjoying the comic so well. Wow I did NOT expect that. There seem to be quite a few of these ‘next-page-cliffhangers’, if you know what I’m trying to say. And I never guess them right. And that’s awesome. Anway, expressions! Pinters is so good (and strangely attractive) in panel 2; the fact that you made his left pupil a little smaller is really helping too. Crazy Kiz at the bottom is AWESOME (and strangely attractive). It’s not over-the-top insane, but his face is a perfect match to what he’s saying. And the blonde guy. HA HA :D He looks so nonchalant in panel 4 it’s making me lol. He is also strangely attractive. P.S. Angora stealing? I’m mortified! lol 8D glad i could return the favour! Is it weird that I like Kiz? Because I do. I’m in love with that last panel. I love jerk characters, and I love sickly characters. And thanks to you, I now love characters with black eyes. Haha, you’re really going to like chapter 2 then! It’s getting scary. :O I’m going to have nightmares! Kiz just keeps getting better and better. I am visioning that the lost one may fight or flee them and join her quest to find his grandfather. Yeah I think I will vote for runaway situation. Next they took of by boat (stowaways) as they meet the Teared Lady the one who not shed tear. Then finally encounters Grandfathers Evil Brother by the sea. Man, you planned your story very well. I’m voting for ya. Keep on going. … though, I like his character and looks. Oh, I love the facial differences you manage to put into a cartoony style! Just now I’m comparing the second and last panel, trying to figure out how to make faces look so different (though the expression is quite similar)…! Oh Kiz. What an evil grin. I look forward to compare it with Luca’s. Haha, I wonder if Luca even grins in this upcoming chapter? I am reigning in the humor a bit more, so he may be a little more somber (not that he isn’t already). Heh, thanks for telling… ah, I found the look of the teeth similar, Kiz looks like grinding his teeth and Pinter like hissing through them… huh. The secrecies of cartooning revealed…! I confess I expected them to grab Angora, but the pants were a big surprise. Ok, so Pinter is the lost one Mocheril talked about. Poor guy, he’s stuck with Angora. I hope he manages to keep his nose. third panel is fantastic. Her expression is so awesome. GAH Pinter becomes more loveable with every page. <3 I cannot wait to see Angora and Pinter’s future interactions while on their little adventure. It will most likely provide for many lulz. XD I LOVE THIS COMIC!! For some reason I pictured Kiz’s voice to be Jason Lee. The more I read, the clearer I picture it. Is Angora ever going to get a top to match those shorts? Is she going to go to a capital city naked? …Actually I’m sure traveling places would be easier for her when half naked, its the distraction factor. You are much more consistent than most webcomic artists. :) Also.. a lot of times when artists try to update pages fast, they end up with some pages that are lower quality stuff just to get it done. Your stuff is nice and I have not yet been disappointed with a page. I’m one of the jerks that tried to predict this page. In fact I may have been the first jerk to try to predict it. You pretty much totally broke set and threw me for a loop. I like Angora’s collar or scarf, or whatever it is. Nice tough, I mean it. Something bad better happen to that bearded chap for man-handling her, though, that’s just not right. just read Cealdian… could you ge tthe author to activate comments, please? I’d love to comment. Also suggest to him an RSS feed. That would be awesome, too. Grrr….let go of Angora, you brut and that Kiz guy is making me crazy with how he treats Pinter and girlies!! Hmm…if those are Pinters pants, either she’s got a rope around them or she’s gonna loose them anyways. Great art and content. I luvs colour…….a lot. S-Since when is she wearing pants?? God, can I punch Kiz? Please? I’d really love to right now. And those guys.. yes, they ARE jackasses.. with knifes. BTW the expressions were so good, I never noticed any problems with porportions. And I make part of my living as an illustrator! Wow! I just started reading today and i already can’t wait for the next update. *points to 1st panel* PANTS! Cool!! Jeez these lumberjacks aren’t very nice people. Yeah! Where are the pressed wild flowers and buttered scones for tea? And where, I ask, are the bras? lol, In this situation the lumberjacks aren’t the ones who need the bras, it’s Angora and Pinter who do! You know I’ve been thinking, is this going to be the first chapter of your story? and how many chapters are you gonna make? Yes, this is the first chapter. There are going to be 40+ chapters as far as I know right now, I’m not quite sure. There are also 3 story arcs so the next chapter isn’t going to be about these guys either. I thought by “voting poll” he meant something about the incentives… like which characters we want to see sketched next/what kind of style/whatever. Like I said it is just an opinion sorry for the misunderstanding. I mean voting to see what gonna happens next with your choice of course. Though I’m kinda agree with Luzerne on the new characters seems not a bad idea. It ups to you man you make it so you decide it we won’t force you making them. When I first saw the first panel I was all, “OMG she grew goat legs!” then I realized she was wearing pants. Which was almost more surprising to me for some reason. Poor Pinter :/ I wanna pat him on the back. When I read your comic I can’t help but wonder, “Is Para-Ten boring?” Ha ha. Oh! I say you forgot the color on the left eye of the perverted-blond guy. Oh, thats cuz he got punched in the eye earlier… XD Its a bruise. LOLZ! you should TOTALLY make this into a comic series ^_^ YOU BE RICH!!! I really thought the coloring looked really good too, the muted tones came out great. Also, yay for adult language! Awesome page. I think it looks great. :) A lot of characters in one panel is tricky but you pulled it off perfectly! Gawd, I love his last panel face. I agree with you, Kiz, It´s really not fair. They should have given you the old heave-ho, instead! By the way, I love the facial expressions. x3 You always draw the best ones. I can picture you making each face as you draw them (I read your tutorials. Sometimes a little too thoroughly. o_e ), and hey, whatever helps! I got caught doing it a couple of times.. . ~ . ahw! details!! Kiz! His eye!!! More like she grabbed the clothes for pockets/belt loops than anything. Oh, Angora, will you ever wear a shirt? ._.